Some people train horses because they love them, some people teach because they love students. I do both because I love people and horses. I am not a trainer, I am not a teacher. I am an interpreter between people and horses. Sometimes it feels more like being a marriage counselor. Horses will teach their people everything they need to know if they know how to listen. I started training and teaching for the public because I knew I could help people. 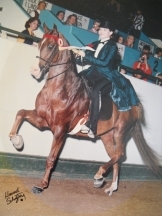 I have been in the horse industry for over 20 years. I know there is no money in it. I just want to feed my horses and family and help people and their horses have better lives. I grew up in Minnesota wanting a horse in my suburban back yard. That didn't happen. 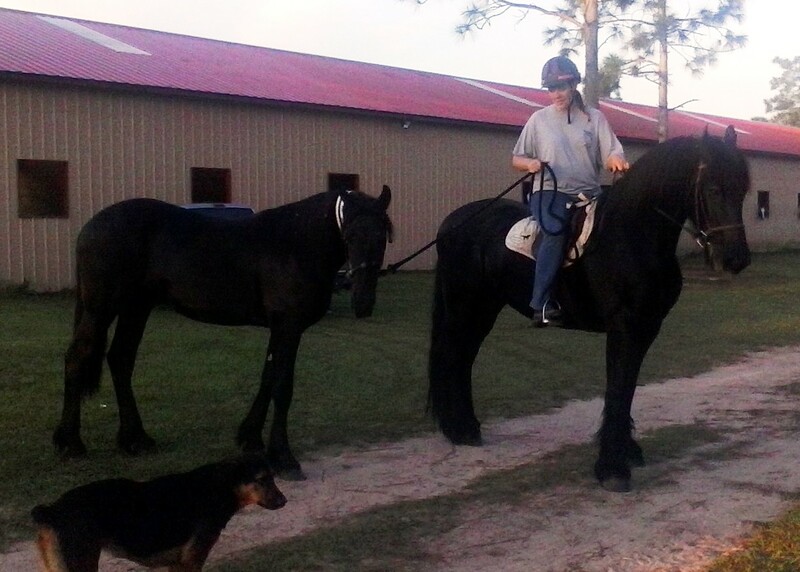 We had some great neighbors with horses that recommended a great trainer and barn. 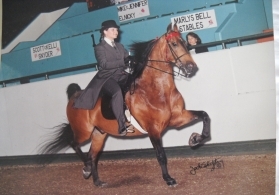 It just so happened that they specialized in Saddleseat riding on American Saddlebreds. I didn't know until I moved away how rare the style of riding was. I was lucky enough to grow up working around a large training barn call Centre Pointe in Delano, MN. They still train amazing horses. Since we didn't have alot of money and this was a high dollar hobby, I worked around the barn as much as I could. I was a sponge. When I got a break I would just peek into the arena and watch trainers work. One day I remember vividly watching Len Fries train a young horse and he was so calm and focused with this high stepping horse dancing under him. It was magical. Len saw me watching and invited me into the arena and told me to ask questions. As I rattled away I think he may have regretted this decision but he patiently answered all of my questions. That day I developed my trainer head tilt. You can see it in many people as they study how a horse moves. I also understand now how hard it is to teach and train at the same time. He was very gifted. The Centre Pointe barn has over 30 stalls and I was lucky to work around alot of different horses and each one is unique. The horse pictured with me above is Starting Over AKA Replay. He is still showing today. 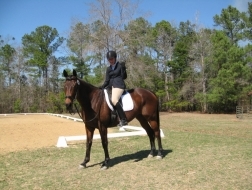 I learned ALOT at Centre Pointe and was able to ride a variety of horses. I feel very blessed for that time in my life. And very thankful to Todd Perkins, Judy Jensen and the late Len Fries for putting up with me and giving me the swift kick in the pants when I needed it. A HUGE THANK YOU TO MY MOM, MARIAN DOUGLAS. That poor woman toted me all over creation( Kansas City, St Louis, Madison, WI, Souix Fall , SD, and on and on) chasing that big horse trailer with the buggies on top. I took it all for granted. I moved away for school and thought I could leave the horses behind. Of course every time I went home I went to the barn and rode anything they would let me. It was in my blood at this point. After graduating from UWF with a Bachelor's degree in Natural Sciences and moving to Panama City I found a barn on Hwy 231 and discovered that not everyone had the horse experiences I had. It was an amazing discovery to me. I leased a great horse and it was all over. 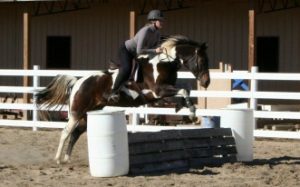 I later bought a horse, then a couple more, then moved to my own place and I have been teaching and training ever since. I understand that sometimes people just need a little hand with their horse, sometimes they need a full time trainer and sometimes they just need a little advice. I am very flexible and will help out in any way I can. However I will not set you up for failure. If your goals or objectives will not work with your time frame or selected equine partner, I will be very frank. Please do not be offended but remember, I do not have a magic wand. To become a rider takes time and riding!! People's safety comes first, then horse's safety, then horse's needs, then people's needs. As your instructor/trainer, I will never ask you to do something I do not completely believe you can do. I will never ask you to ride or drive a horse I won't ride or drive. I am your crash test dummy. I have been there and done that, just ask for the info and weigh out your options. If you ever have any questions just ask. I will answer or tell you I don't know. My philosophies have not changed in the ten years I have been running Red Oak Farms however I have discovered that the owner's commitment is crucial. I do not have a magic wand! Nothing replaces focused training time with your horse. The relationship is important to you and your horse.